The discovery of gold at Canyon Creek on June 8, 1862, brought a rush of people and supplies into the upper John Day basin. 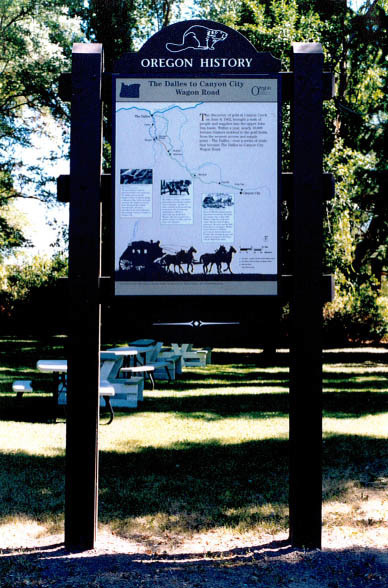 Within a year, nearly 10,000 fortune hunters trekked to the gold fields from the nearest access and supply point – The Dalles – over a series of trails that became The Dalles to Canyon City Wagon Road. Sidebar: The most popular routes to potential fortune went south from The Dalles and crossed the Deschutes River at Sherar’s Bridge or Maupin. Other routes trekked east from The Dalles to cross the lower Deschutes River before turning south. All routes converged in the area of Shaniko and Antelope to form a corridor to Canyon City. Sidebar: The Dalles to Canyon City Wagon Road passed through the original town of Antelope—located 1.5 miles northeast of the present-day community. Old Antelope was established in 1863 as a stagecoach stop by Howard Maupin. The town moved to its present location in 1881 when the stage route changed. Sidebar: Henry H. Wheeler opened the first stagecoach line between The Dalles and Canyon City in May 1864. Wheeler’s stage line made three round trips per week carrying passengers, the mail, and the Wells Fargo Express. Wheeler became famous in 1866 for surviving an Indian attack—shot through the jaw with a bullet, he escaped on horseback with the Wells Fargo agent.